I Skate, Therefore I Am: 20 Fcking Years and counting! Throughout November DC celebrates 20 Years of pro skateboarding by one of the most iconic and legendary skaters of our time: Danny Way. Check out http://www.dcskateboarding.tv for exclusive content celebrating his career so far, including a new video every day for the next 20 weekdays throughout November. Even people who don’t follow skateboarding have probably seen a photo of him. At the age of six, Way began skating street at Del Mar Skate Ranch with his older brother Damon (Co-Founder of DC). By the time he was 10 he had two sponsors, and by the age of 12 he had discovered vert, joined the H Street Skateboard team as an amateur, and launched immediately into production of “Shackle Me Not” and “Hocus Pocus,” two of the most influential skateboard movies of all time. After turning pro at the very young age of 14, he kicked off DC as the first team rider along with Colin McKay, with various contest wins and accomplishments in the late ‘90s giving him more fame and respect. 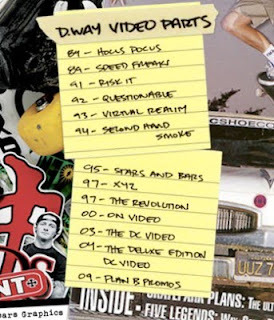 After jumping out of a helicopter into a vert ramp twice, his vert, MegaRamp, and street performance in “The DC Video” and follow up in “The DC Video, Deluxe Edition” gave him unprecedented notoriety, including earning “Thrasher’s” Skater of the Year making him the only skater to earn the prestigious award twice. As far as records and accomplishments, in 2004 he rolled into a gold medal in Big Air (on the MegaRamp, invented by Danny himself) at the X Games, then again Gold in 2005, 2006, a Silver in 2008, and a Gold in Big Air Best Trick in 2009. Global acclaim followed in 2005 when he became the first person to jump the Great Wall of China on a skateboard. The follow-up was a drop from the 82’ neon guitar outside the Hard Rock Hotel Las Vegas, earning him another world record: highest bomb drop. The list of World Records, medals, and wins is seemingly endless. Beginning today visit http://www.dcskateboarding.tv for the release of a video clip a day for the next 20 weekdays. A combination of legendary as well as never before seen footage will provide a level access and insight into his career that only DC can provide. DC Staff Photographer Mike Blabac has also assembled a gallery of his favorite Way photos from over the years. Blabac has been the key photographer for much of Danny’s accomplishments, so the gallery at http://www.dcskateboarding.tv is a great recap of many of his career highlights, going back to photos from Way’s first vert pro contest win in 1989. Way’s other sponsors—Plan B Skateboards, New Era, Pacific Drive, Independent Trucks, Nixon—are also supporting his 20th Year in a variety of interesting ways. Check out each of their sites for more on Way’s incredible career. To celebrate Danny’s 20 years of Pro Skateboarding we teamed up with legendary skateboard artist Wes Humpston to create a special custom 20th anniversary graphic. Danny way 20 year collection will be available in spring 2010.